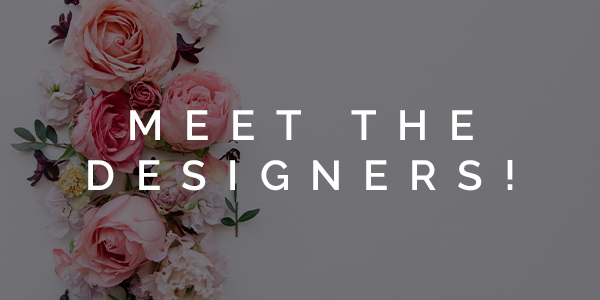 From time to time, LivRio will feature Interviews with some of the industry’s most interesting Floral Designers, to find out what inspires their creativity and learn about new trends in the industry. This month, we interviewed Matthew Blind and Garrett Skupinski, who recently teamed up with Rio Roses to conduct a class at the Great Lakes Floral and Event Expo entitled, “One Dozen Roses One Dozen Ways”. Garrett is an internationally-recognized designer as a Floral Fundamentals Ambassador, winning many design awards internationally. His love for haute couture experimental design styles, unique large-scale displays, and international design techniques is evident in his work. Garrett’s passion for floral education and design has taken him throughout the United States, Canada, and multiple countries in Europe. When did you start developing these amazing flower designs and where do you get your inspiration? I had an amazing teacher at a young age, and strong mentors pushing me to continually seek further education and floral experiences to develop my skills. But no matter what level I achieve, it’s important to remember that there’s always something new to learn and many are currently “reinventing the wheel”. Finding inspiration is just as much of an adventure as creating the design! Everything inspires me, from senses to the waves of the ocean; it often depends on what I’m creating or the task I’m trying to achieve. What led you to start educating others in floral design? I got my start in education because I wanted to reciprocate what was given to me as a student. I was privileged to be able to return to high school classes and share my passion for design with the next generation, the future of our industry. Even though I’ve been able to travel internationally and share my floral passion with others, it’s still very important to me to always be available to younger designers and those seeking to learn and grow. What is your vision for the new generations when it comes to buying habits, flowers trends, and flower designs? Unfortunately, I have no expectations for the future of floral design. I have hopes but am intrigued to see what happens. Younger generations are continuously struggling financially as the economic divide expands. I feel that flowers will become even more of a luxury, with less people being able to enjoy flowers in a very short time. Which flowers do you consider the trendiest moving forward? At one time it was the individual flower that was popular, but now it’s more about the attributes of the flower. People are looking for colors, textures, and other attributes in a more aware way, but there will still be favorites such as peonies, orchids and so on. It’s our responsibility to continually educate our consumer and strive to not always work with trend, but what is actually correct for our customers and designs. Anything you would like to share about your relationship with Rio Roses? Rio Roses has been there for everything from international competitions to personal floral jewelry. The ever-expanding variety of products and quality makes Rio Roses one of my one-stop shops for my variety of projects and floral adventures. Matthew is a freelance floral and mixed media designer based in St. Louis, Missouri. 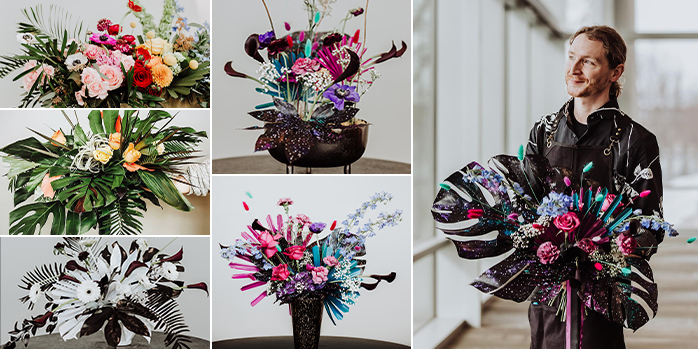 His love of flowers started at an early age, and the passion grew into a career that’s taken him across the country to collaborate with other designers. 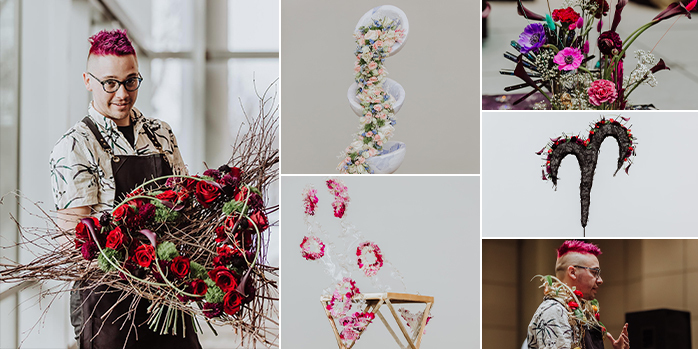 Seeking ways to share his love of flowers and floral design with the world, he began teaching workshops and classes in 2018 with other professionals and passionate amateur designers alike. What is your inspiration for your floral design classes and workshops? When we started working on this project, I had some conceptual ideas I knew I wanted to touch base on. I had previously played around a little bit with the galaxy painting technique I do, but I knew I wanted to expand upon that for a multiple design collection. Garrett and I worked together to establish a few themes that we both could play with, like geometry and contrast, and tribal, because we wanted to showcase our different design aesthetics while given the same topic. Since the contrast pieces I was working on were solely black and white, it seemed fitting for me to create a rainbow collection to really play with the full spectrum of Rio products. Inspiration can strike me anywhere, from the structural lines of architecture to the vibrant colors of street art to the natural geometry of green spaces here in the city. When you open yourself to the beauty that surrounds you, inspiration is all around. What role do you feel education plays in the life of a floral designer? Education is crucial. Even though I haven’t been in the industry a very long time, I am constantly immersing myself into education. There is no wrong way or right way to design, but through education you are able to learn techniques other designers have mastered and apply them in new ways to your designs. The more techniques you have in your repertoire, the more interesting your designs become. I also began educating others while freelancing with other designers, showing them tips I had picked up along the way, and taking some of their new ideas with me. What opportunities do you see in the floral industry when it comes to younger generations? Younger generations want high impact at a low cost. The traditional things we have been selling need an update for new generations to take notice. Introducing new colors and varieties like Rio’s Hypnosis Carnations, that offer subtle twists on things they already are familiar with, is a great way to get millennials interested. Mixing classic florals with tropical and exotic foliage is another way to pique interest. Are there any specific trends you see coming in the near future? I think moving forward, we are going to see a return to some classics that have fallen out of favor in the past few years. I am absolutely LOVING the new varieties of multicolored and variegated Carnations that Rio has been releasing. I think being a “value flower” that still offers a stunning appearance with longevity will make them very popular among the younger generations. My favorite flower is Ranunculus, so I want to see those everywhere I can! I am VERY excited to get my hands on some of the new Rio hydroponic Hanoi Ranunculus! How do you feel about your relationship with Rio Roses? I am so grateful for the support Rio has given me! It’s wonderful to feel so supported by such a fantastic company, and I can’t wait for the opportunity to partner with Rio again. I am also looking forward to more new amazing products to be released, as the Jungle Exotics and Foliage collections are a fantastic addition to the top-quality products Rio offers. Next article	The “Newest” Floral Trend: Dried Flowers!